Once an uncommon clinical finding, the Chiari malformations are now frequently seen with the advent of more sophisticated imaging modalities. With over 100 years of experience with these entities, we currently have a much better understanding of their embryology and pathophysiology. 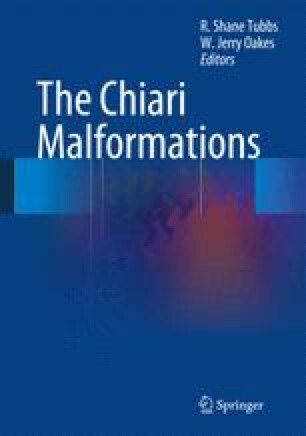 However, many gaps still exist in our knowledge of the Chiari malformations. Long-term outcome studies are becoming more prevalent and patients are commonly operated on with generally favorable results. Since their original classification, the Chiari malformations have grown to include smaller subsets. Herein, we focus on the two most common forms of hindbrain herniation, the Chiari I and II malformations. As with any rapidly changing field, knowledge of the natural history of the untreated condition is essential before recommending intervention.